SINGAPORE: The bare and sandy seabed around Sisters’ Island may soon be teeming with marine life, with the installation of a reef structure on Thursday (Nov 8). 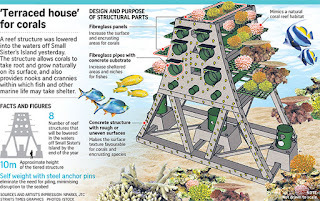 The 10m-high concrete and fibreglass structure will act as “artificial reefs” for marine flora and fauna to colonise. Its bumpy surface, made from recycled stone fragments, will help encrusting organisms such as barnacles or shellfish to attach themselves and grow. The fibreglass pipes will also increase sheltered areas for fishes. This is the first of eight structures that will be lowered onto the seabed to create Singapore’s largest artificial reef habitat, in a collaboration between government agencies JTC and National Parks Board (NParks). The towering structure is designed to allow marine organisms to occupy the entire water column, from just under the surface of the water to the seafloor. This will allow a variety of marine life at different depths to create their own habitats. Dr Karenne Tun, director of the coastal and marine branch at the National Biodiversity Centre, said she expects to see the first signs of marine life on the structures within the first three to six months of installation. “We expect the first things to grow to be the algae … Then barnacles will come in and start settling. Over time, other species will start to settle ... and they will displace some of the early colonisers until it comes to a stable equilibrium. That will be anywhere from a couple of years,” Dr Tun said. The seven other structures will be installed in the same area by the end of 2018 to form the JTC-NParks Reef Garden. Altogether, the project is expected to contribute about 1,000 sq m of additional reef area by 2030. The materials used were tested and have proven to be “very good” for reef restoration purposes, said Dr Tun. These structures are projected to last about 100 years, with minimal repairs or maintenance needed, she added. Attention was also paid to minimise disruption to the seabed by using steel anchor pins, said John Kiong, deputy director for JTC’s engineering and operations group. “The steel anchor pins help to lock the structure in place. The structure sits on the seabed itself with its own self-weight so no piling works are required,” Mr Kiong added. Stephen Beng, chairman of the Friends of the Marine Park and Nature Society’s Marine Conservation Group, said that the community had provided input to guide the project. “It’s something we’ve been asking for a long time,” Mr Beng said. “We asked questions on the composition of the materials, for example. Whether it was resilient to time and change and whether there was enough flow for the corals to grow,” he added. The eight reef structures will complement ongoing reef enhancement efforts to safeguard about 250 hard coral species found in Singapore waters. They account for 32 per cent of hard coral species found worldwide. Speaker of Parliament Tan Chuan-Jin, who was Guest of Honour at the event, said that healthy coral reefs can benefit Singapore in many ways, including protecting shores against erosion and storms, sustaining marine fisheries and serving an important source of novel compounds from which biomedical projects can be developed. Hence, there is a need to look into the long-term conservation and management of Singapore’s coastal and marine environment. “There is no silver bullet to overcome our environmental challenges. What we often need is a range of multi-disciplinary solutions involving expertise from different parties,” Mr Tan said. The artificial reefs will provide opportunities for research and test-bedding of technologies that will contribute to coral reef diligence. There are also plans to establish a coral nursery for conservation purposes within the reef garden, said NParks. “All of these efforts will contribute to expanding our knowledge and understanding of Singapore’s marine habitats and the biodiversity they support,” Mr Tan added. Eleven companies had contributed S$290,000 through the Garden City Fund to the S$1.6 million project. SINGAPORE - The Republic's largest man-made reef structure to date was installed on Thursday (Nov 8) in the waters off the 3ha Small Sister's Island, which is south of Sentosa and about a 45-minute boat ride from Marina South Pier. It is part of an installation that comprises eight reef structures in total, all fabricated off-site. They will be fully installed by the end of 2018. When the corals grow, these reef structures are expected to contribute some 1,000 sq m of additional reef substrate to the Sisters' Island Marine Park by 2030. The installation constitutes an important expansion of conservation efforts in Singapore's Southern Islands, of which the Sisters' Islands are a part of, and is part of the "Grow-a-Reef Garden" project, a collaboration between JTC and the National Parks Board (NParks). First announced in May this year, the project was proposed as part of efforts to protect the coral reefs around Singapore and enhance marine biodiversity in the island's surrounding waters. 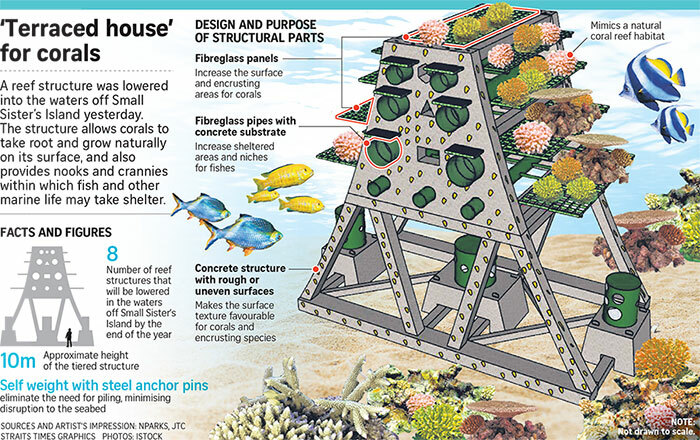 Each of the 10m-high structure will form a three-storey "terrace house" upon which corals may take root and grow, while also doubling up as a new home for other forms of marine life to live in and flourish, said Speaker of Parliament Tan Chuan-Jin, who witnessed the installation of the first structure on Thursday. Representatives from JTC and NParks, members of the Friends of Marine Park Community, donor companies, industry guests, as well as local marine research and interest groups also attended the event. The structures will sit in the 40ha Sisters' Islands Marine Park, about the size of 50 football fields, which comprises the Big Sister's Island and the Small Sister's Island and their surrounding reefs, as well as the western reefs of nearby St John's Island and Pulau Tekukor. They are made of materials including concrete, fibreglass pipes, steel and rocks recycled from other JTC projects. Each structure includes nooks and crannies within which various fish species and other forms of sea life may find shelter and thrive. To date, there has not been a reef installation on a larger scale in Singapore. Eleven donor companies have pledged support to the initiative, each contributing sums ranging from $5,000 to $100,000, for a total of $290,000. Besides helping to pay for the implementation of the reef structure project, the monies will fund monitoring programmes, research projects, education and public outreach activities. "We are heartened by the generous support from our industry partners on the "Grow-a-Reef Garden" Initiative," said Mr Ng Lang, chief executive of JTC. "We hope that more from the industry and community will join us to create a more sustainable environment." The reef structures are intended to transform bare seabed into a flourishing marine ecosystem, allowing corals to take root, and in turn attract fish and other marine life. "The project... will be significant in supporting marine habitat enhancement and reef restoration efforts," said Mr Tan. He added: "There is no silver bullet to overcome our environmental challenges. What we need is a range of multi-disciplinary solutions involving expertise from different parties." Mr Tan said long-term conservation and management of Singapore's coastal and marine environment are essential for Singapore's future. "This is particularly timely as the International Coral Reef Initiative has designated this year as the International Year of the Reef, and this project will help our efforts in enhancing Singapore's coral reef ecosystems," he added. Restoring reef substrate is an essential step to recover damaged reefs that have become unsuitable for coral populations to settle. The new reef structure installed on Thursday will provide new substrate for corals to attach to and grow, mimicking the natural coral reef habitats observed around Singapore. After they are installed, they will be monitored through research initiatives coordinated by NParks which will involve various marine interest groups. 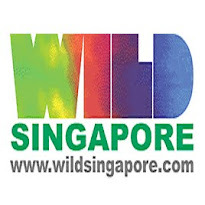 Mr Kenneth Er, chief executive of NParks, said the project will facilitate research initiatives that will go a long way in supporting conservation efforts in other marine areas of Singapore. "Our marine biodiversity is our common natural heritage, and we are glad to see partners stepping forward to conserve it," Mr Er added. Singapore has lost approximately 60 per cent of its reefs to land reclamation over the years. Local reefs are also recovering from a bout of bleaching in 2016, which was caused by a prolonged period of high sea surface temperatures. Corals that are stressed by sudden changes in temperature, light, or nutrient levels expel the microscopic algae that live in their tissues. The algae, called zooxanthellae, have a symbiotic relationship with the corals. They are the coral's primary food source, and give a coral its colour. Without the algae, the coral is deprived of its major source of nutrients. It then turns white or very pale, and becomes very susceptible to diseases. Partially bleached corals were observed around Big Sister's Island in November 2016. It was estimated that about 15 to 20 per cent of corals in Singapore's waters died because of the bleaching. In a statement, NParks said the installation complements other efforts to expand the scope and scale of other marine habitat restoration programmes. For instance, the NParks in-situ coral nursery will also be established in this Reef Garden. Rare corals that may be threatened by coral bleaching can also be moved to this controlled environment, in an attempt to ensure their survival. "We are heartened by the efforts of the business community in sharing our goals to conserve marine biodiversity and encourage vibrancy at the Sisters' Islands Marine Park," said Mr Stephen Beng, chairman of the Friends of Marine Park community. "We are hopeful about the enhancement benefits this new reef habitat will bring to life in our waters."